Kom Ombo is situated on the east bank on a bend of the river Nile, just south of Gebel el Silsila, about 50 km north of Aswan. It is easily to visit in one day from Luxor or Aswan and is a popular stop for river cruises. In ancient times Kom Ombo stood on an important crossroad between the caravan route from Nubia and trails from the gold mines in the eastern desert. During the reign of Ptolemy 6 (180 – 164 BCE) it became a training depot for African war elephants. Kom Ombo is home to an unusual double temple in Greco-Roman structure, built out of limestone on a high dune overlooking the Nile. The temple was built during the Ptolemaic and Roman period between the second and first centuries BCE. It was Ptolemy 6 who started the building at the beginning of his reign and added to by other Ptolemys. Ptolemy 13 built the inner and outer hypostyle halls and Emperor Augustus (30 BCE – 14 CE) added the final touches. Since the bend in the Nile was a favourite spot for crocodiles to bask in the sun and threaten locals, it is natural that the temple would be dedicated to Sobek, the crocodile god, who controlled the waters. Unusual however is that the temple has a double dedication: it also honours Haroeris (Horus the Elder), a form of the falcon headed god Horus, the solar war god. 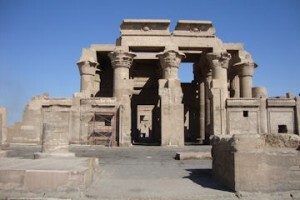 The temple is also known as ‘House of the Crocodile (Sobek)’ and ‘Castel of the Falcon (Horus)’. The temple is unique because it is in fact a double temple. The design combines two temples in one with each side having its own entrances, courts, hypostyle halls, sanctuaries and chapels. The southern half of the temple was consecrated to the crocodile god Sobek. The northern part of the temple was consecrated to the falcon headed god Haroeris. The temple is atypical because everything is perfectly symmetrical along the main axis. There are only a handful of pharaoh remains, but the scene on the inner face of the rear wall of the temple is of particular interest, and probably represents a set of surgical instruments. A few of the three-hundred crocodile mummies discovered in the vicinity are displayed inside the temple, in the little chapel of Hathor. The museum displays 22 mummified crocodiles of various sizes out of forty to which have been unearthed in the area. The crocodiles are arrayed on a sand hill inside a large glass showcase, allowing visitors to see how crocodiles passed their days in ancient Egypt. A collection of crocodile coffins and wooden sarcophagi, along with crocodile foetuses and eggs, are also on display, in addition to stelae and statues depicting the crocodile-god Sobek, bearing a human body and the head of a crocodile. Replicas of Sobek’ original tombs and niches are also on display.